There are 33 vertebrae that make up the spine. There are 7 cervical vertebrae in the neck, 12 thoracic vertebrae in the upper back, 5 lumbar vertebrae in the lower back, 5 sacral vertebrae in the sacrum, and 4 fused coccygeal vertebrae in the tail bone. Between these vertebrae are discs known as intervertebral discs that are filled with a gel-like substance. These discs function as a shock absorber and connect the vertebrae. A disc can rupture or herniate when there is too much pressure on the spine. Repeated injuries, excess weight, or overstretching can be simple causes of a herniated disc. When it ruptures or herniates, the content of the disc may compress on nerve roots leading to pain, weakness, and numbness. Patients with thoracic herniated disc may experience pain that is aggravated during coughing or sneezing. The pain can also radiate to the chest or abdomen leading to many confusing diagnoses. 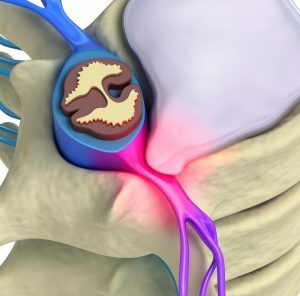 The diagnosis of a thoracic spine herniated disc is very serious as its location in the middle back means that there is very little space for the spinal cord to pass through in this region. Statistics have shown that less than 1% of disc herniations are of the thoracic origin. Most patients can be treated conservatively with a short period of rest and modification of activities. Medication to reduce pain, strengthening exercises, and manual manipulation by a chiropractor or osteopathic doctor can also be helpful. If conservative approaches have failed, patients can move on to surgery. Usually, the approach to release the compression is done through the back but in thoracic spine herniated discs, there is a central component that cannot be reached without retraction of the spinal cord. Surgery is, therefore, more complicated. Central or Centro-lateral herniations: an open surgery can be done through the front (chest) instead of the back. This can also be done as a minimally invasive surgery known as a Video Assisted Thoracic Surgery (VATS) requiring small incisions, small scopes, and a screen for the video. Lateral herniations: discs that herniate laterally can be treated using a posterolateral approach. This is known as constotransversectomy which requires the removal of ribs and the transverse process (small bone attached to part of the spine) so that there is access to the affected disc. 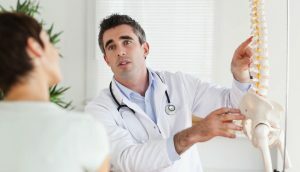 Due to the complicated process in these procedures, surgery is considered a last resort for cases where there is a progressive weakness in the lower extremities, and numbness or tingling that does not improve using conservative treatments. Existing literature suggests that surgery performed through the chest cavity has a better outcome compared to the constotransversectomy approach. For the VATS procedure, researchers have reported a 76% satisfactory rate. Just like all other spinal surgeries, physical therapy and activity modification are recommended for patients to improve success rates and to shorten recovery time. Activity can be gradually increased accordingly as per the progress and limits of the patients. Pain and discomfort can be reduced with the aid of painkillers that are prescribed or available over the counter. Regan JJ, Mack MJ, Picetti GD. A technical report on video-assisted thoracoscopy in thoracic spinal surgery. Spine. 1995; 20:831-837. DeWitt D. Thoracic Herniated Disc. Spine-health. Accessed 6/21/2017.